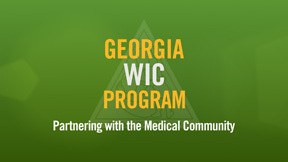 As a healthcare provider, you are a key partner in serving Georgia WIC participants. In this area, you will find information about recent changes in the Georgia WIC Program and access to new medical documentation forms and special formula resources. Please click on the below image to view a brief video presentation about changes to the Georgia WIC Program and the impact on your medical practice. 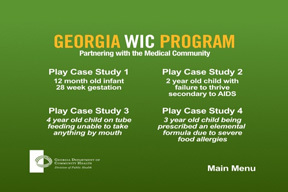 Please click on the below image to view a brief video presentation of 4 case studies demonstrating how to complete the new Georgia WIC medical documentation forms. Breastfeeding should be promoted as the optimal feeding method for infants. This guide can assist you in prescribing formulas when breastfeeding is not desired, if supplemental formula is introduced, or if breastfeeding is medically contraindicated. Breastfeeding should be considered and encouraged when common conditions arise with guidance from a physician and lactation consultant. This link takes you to copies of the new Georgia WIC medical documentation forms and information about the formulas authorized for use in the Georgia WIC Program. WIC Approved Foods List- This link takes you to a copy of the Georgia WIC Approved Foods List. The foods list is available in both English and Spanish.